Amanda Moreno always knew she wanted to be a teacher, and four years ago, after working for some time in Contra Costa County, she took a job as an English teacher at Berkeley High School, or BHS. Moreno loves the community and feels respected by her fellow staff members and the administration, but she worries about the possibility that she may have to leave — she is finding it harder and harder to make ends meet in Berkeley. Moreno currently lives in the bottom of a two-story unit with one roommate. The apartment is rent-controlled, and that has “just made it bearable.” But she said she feels trapped. Since starting her career in California, Moreno has never been able to afford to live alone, and getting a house feels like an impossibility, especially because she recently used all of her savings to pay off her student loans. According to a district response relayed by Berkeley Unified School District spokesperson Charles Burress, a housing survey of district employees conducted in October 2017 concluded that only 30 percent of employees live in Berkeley, and only 42 percent of respondents said they owned their residence. 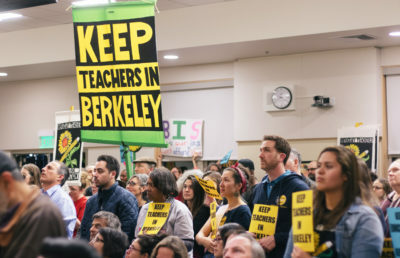 The survey also found that more than half of all employees who rent have considered leaving the school district because of Berkeley’s high housing costs. In the 2017-18 school year, the average salary for a Berkeley school district teacher was $75,962, lower than the California average of $80,058 a year, according to the Education Data Partnership. The average rent in Berkeley for a two-bedroom apartment — at a cost of about $3,290 a month as of March 2018, according to a report by the apartment listing site Abodo — would consume almost half of the average teacher’s salary. 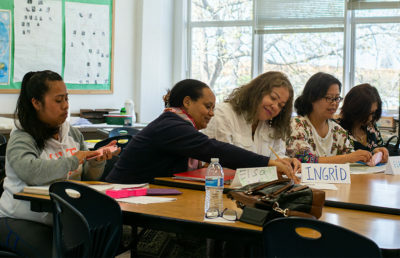 Cathy Campbell, the president of the Berkeley Federation of Teachers, or BFT, said the teachers federation’s top priorities are to provide members with a “meaningful” increase in compensation so that the school district can increase its competitiveness, retain teachers and increase the number of special education support staff and case managers. Moreno says she knows that living in Berkeley may not be healthy for her future and that this reality could force her to move. If she wants to start a family, she would not be able to stay in her apartment, and she said it is “really anxiety-provoking” to think about how the housing market will change within the next few years. One of the reasons why Moreno is so connected to BHS is that she teaches a class on Latinx literature and is one of two teachers in the Chicanx/Latinx studies department, which she said is a rare program nationally. Plonsey, who said he was lucky to be able to buy a house in Berkeley in 1997, added that it can be beneficial to the learning of students of color when they have teachers who are also people of color. Yet even if teachers do not have to leave the school district entirely, many have been forced to live in neighboring cities, leading to long commutes. When teachers are unable to live in or near the area in which they work, Campbell said, there are many ramifications: They may not be able to attend PTA meetings, go to students’ sports games or meet with students’ parents after they get off work. Moreno calculated that she works about 35 hours a week outside of the time she gets paid, without counting the time spent at events such as school plays. She mentioned that she sees many of her colleagues taking on second jobs, which can negatively affect their performance in the classroom. Some programs already exist that help support teachers in Berkeley. Teachers and classified staff have some access to credit and mortgage assistance through their unions, according to Campbell. Teachers are also offered flexible spending accounts, according to the district response relayed by Burress, that allow them to receive part of their pay in nontaxable accounts from which they can pay for medical expenses and child care. The school district also entitles teachers to free counseling sessions. “We have been in discussions with the City of Berkeley about such issues as workforce housing as a partial solution, but we also recognize that in order to attract and retain great staff for our schools, we have to tackle some really thorny issues around housing costs and around compensation,” according to the district response relayed by Burress. According to the district, the primary source of its “struggles in terms of compensation” is insufficient state funding. 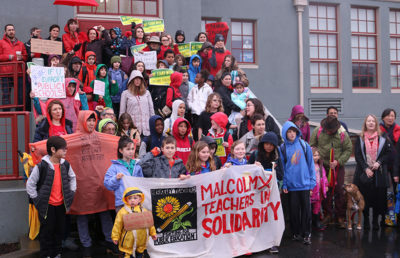 Although the district is supported by the Berkeley Schools Excellence Program tax — a local tax that helps support students and staff by, for example, decreasing class sizes — the response noted that this support only brings the Berkeley school district up toward the median per-student funding when adjusted for cost of living and does not, in fact, address all unfunded district needs. Berkeley school board members have been meeting with Berkeley’s representatives in the state Legislature to ask for support and have also passed a resolution asking Gov. Gavin Newsom and the Legislature to make full funding of public education a top priority. Many teachers, including Plonsey and Lubalin, have begun to look at statewide and nationwide teachers movements as sources of change. Lubalin, especially, is waiting to see how things “shake out” regarding the new statewide movement, as that may well affect her ability to continue teaching in Berkeley. Boyce Buchanan is the lead schools and communities reporter. Contact her at [email protected] and follow her on Twitter at @BuchananBoyce.